On this sparkling blue Sunday in Crystal Beach Florida, we followed the music and made our way over to the first annual Citrus Festival. The streets in this exquisite section of historic old palm harbor form a quaint labyrinth that showcases all the shops and eateries that make it a great place to hang out. This past weekend the entire area around Nebraska and Florida Avenues were closed off to accommodate a full spectrum of classic carnival rides and games. Savory snacks sizzled on grills and the multi-tap Budweiser truck dispensed frothy glasses of beer to the Palm Harbor revelers. As usual, the Palm Harbor Chamber of Commerce events staff did an outstanding job (with a bevy of hard-working volunteers) hosting a tremendous time in this beautiful hamlet in North Pinellas County. With all of the excitement, we dropped our Flip video camera and lost the Ferris wheel video. Yet we managed to save this shot of a high-flying ride against the backdrop of the downtown Palm Harbor sky. 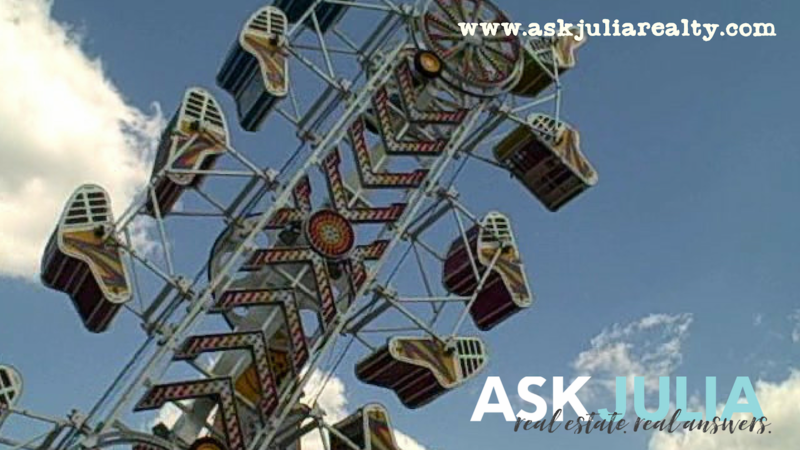 If you'd like more information about living in Palm Harbor or area homes for sale, feel free to contact me (Julia) here or at 727.366.0324 phone or text.